Defense attorney Michael Madden delivers his closing argument on behalf of Dr. Jens Chapman and Harborview Medical Center. Click here to see video from the trial. Seattle - A state court jury sided with the University of Washington and one of its physicians on Friday in the first case to go to trial over the use in spine surgery of injectable bone cement manufactured by Johnson & Johnson unit Synthes, that a grandmother’s family claimed caused her sudden death during routine back surgery. A 12-member jury deliberated for more than three days - at one point telling the judge they were nearly deadlocked - before deciding 10-2 that 67-year-old Reba Golden’s death in 2007 wasn’t caused by any negligence on the part of her surgeon, Dr. Jens Chapman, or UW’s Harborview Medical Center. Golden’s attorneys claimed Chapman injected Synthes’ Norian bone cement into her spine despite the FDA not approving it for that use, and that he failed to warn Golden of the cement’s potential to cause fatal bleeding and blood clots. Attorney Rick Friedman of the firm Friedman Rubin asked jurors to award $6 million to Golden’s family and to assign five percent responsibility for her death to Synthes. Synthes was a defendant in the case when the trial began on June 27, but they reached a confidential settlement with the plaintiffs shortly before attorneys delivered their closing arguments. The jury did find that Chapman failed to warn Golden about Norian’s risks, but also determined that even with a clearer warning a reasonable person still would have consented to its use in back surgery. Other similar lawsuits against Synthes have been settled before trial, and this case marked the first time claims related to the use of Norian cement in spinal surgery went before a jury. Jurors were required to absorb a staggering amount of complex medical and scientific information, hearing testimony from 37 witnesses over 25 days, 13 of which were retained as experts. Friedman argued that Chapman and UW knowingly participated in an unauthorized “test market” of Norian that amounted to human experimentation, but attorneys for the hospital maintained that Chapman had successfully used Norian cement in spinal surgery on 28 prior occasions, and that an off-label use of a product doesn’t automatically fall below the standard of care. Norian cement is injected to help strengthen weakened or injured bones, and has for years been approved by the FDA for use on parts of the body like the skull or femur. After Synthes acquired Norian in 1999, it began exploring the use of bone cement in the spine and pressed ahead with a number of test surgeries, despite supposedly knowing spinal injections carried a far greater chance of the cement leaking into the bloodstream and causing lethal clots. The FDA began investigating Synthes in 2004 after a number of adverse results were linked to the use of Norian, and in 2007 the agency required the company to use a new label explicitly stating the cement isn’t meant for use in the spine. In 2009 Synthes and Norian, along with four top executives, were indicted on charges of conducting illegal clinical trials of the bone cement on humans. In 2010 the executives entered guilty pleas and received prison sentences, and the companies agreed to pay over $23 million in fines and penalties. 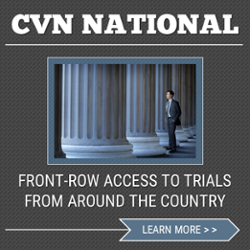 Friedman told CVN no decision had been made yet regarding a potential appeal. He indicated that jurors might have been swayed by an inherent desire to trust highly-trained professionals like Chapman. The trial took place before Judge Jim Rogers. Wilson is represented by Daniel Hannula of Rush Hannula Harkins & Kyler LLP and Rick Friedman of Friedman Rubin. Chapman and the University of Washington Harborview Medical Center are represented by William Leedom and Michael Madden of Bennett Bigelow & Leedom PS. Synthes was represented by Blank Rome LLP. The case is Wilson v. Chapman et al., case number 13-2-29535-1, in the Superior Court of the State of Washington for King County.